If you want to connect your computer to a wireless network then you need to have a wireless adapter. Designed to connect either a computer or even a games console to the internet or to a network, there are various different wireless adapters available to choose from. So what are the differences between the different adapters available? Is it possible to purchase the wrong one? Within this article you will find out everything that you need to know about wireless adapters and how they work. A wireless adapter enables you to connect to the internet or a network via a wireless card or USB device. It eliminates the need for cables and it allows you to have your notebook computer or desktop PC anywhere within the home or office. It does not have to be right next to the main router to connect to the wireless network. Wireless adapters can be used for both personal and business use. The above are the main wireless adapters you will be faced with when you start your search. Each one is designed for different computers and they are installed in different ways. A USB wireless adapter for example, fits into a USB port. It is possibly the easiest wireless adpater to use as most are simple plug and go devices. You just plug them in and they automatically install themselves. You don’t have to worry about taking your computer apart and they are portable too. They typically look like flash drives and you can choose from USB 1.1 standard or USB 2.0 standard. It all depends upon the network that you want to connect to and the standards of your computer. More about standards and what they mean will be featured a little further on in the article. 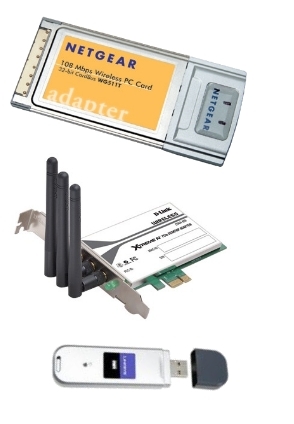 PCI wireless adpaters are also one of the most common varieties available today. They are designed to actually fit into your computer. You have to take your desktop PC apart and manually fit the card into its appropriate slot. Obviously if you do not know what you are doing then this could be difficult. However, you can always get it fitted for you if you pay an expert to do it. Of course you also need to ensure that your computer has a PCI slot on the motherboard as not all PC’s will. Even though you have to take your computer apart to install the card, you should find that it isn’t overly difficult to figure out how to do it. So if you have a desktop PC instead of a notebook then this type of wireless adapter is probably better suited to you. If you do ahve a notebook and you don’t have a USB port then you may want to consider using a PCMCIA (Card Bus). This is designed to fit into a PCMCIA slot on a notebook computer. They have a built in antenna which slightly protudes from the laptop when it is inserted into its appropriate slot. If you are unsure as to whether you have a PCMCIA slot on your computer then look for a fairly long empty slot all around your laptop. If there isn’t one then you haven’t got a PCMCIA slot available. It could even be possible that your laptop already has a wireless adapter installed inside it. This is particularly true for newer laptops. If your notebook computer doesn’t have a long empty slot but it has a fairly small one available then you will require a Mini PCI. This is a smaller version of the PCMCIA and the main difference is that no part of the card protudes out of the laptop. It is all hidden within the notebook and it is slightly more complicated to install than other types of wireless adapters. The Ethernet wireless adapters are different to all other types of wireless adapters as they plug in through an ethernet port via an ethernet cable. They can be used for games consoles such as the Xbox 360 or the Playstation 3. Many gamers connect their console to a wireless adpter as it allows them to play multiplayer games and use a wireless internet connection to log on. Finally Compact Flash wireless adapters are designed to fit into handheld portable devices such as pocket PCs. Your Palm or pocket PC will have a CF slot that you simply slide the wireless adapter into. It can also be used to connect notebook computers to a wireless network. Now that you know the different types of wireless adapters, you now need to understand the different standards available. The Data Transfer Rate of the card will make a difference to the one you purchase. Not all cards are suitable for all computers. For example, wireless adapters that come with 802.11a have a maximum of 54MBPs data transfer rate and an operating frequency of 5GHz. A wireless adapter with 802.11g has a maximum of 54Mbps data transfer rate and an operating frequency of 2.4GHz. You need to ensure that the router you will be using for the wireless adapter supports the standard you aim to purchase. Another thing to look out for when you choose a wireless adapter is the security that it has installed. You want to choose an adapter which has WEP, WPA or WPA2. These basiclaly protect the data transfers within the wireless network. They prevent hackers from gaining access into the network. Overall there are many different types of wireless adapters to be aware of. By understanding the different types available, it will help you to choose the best to suit your wireless networking needs.